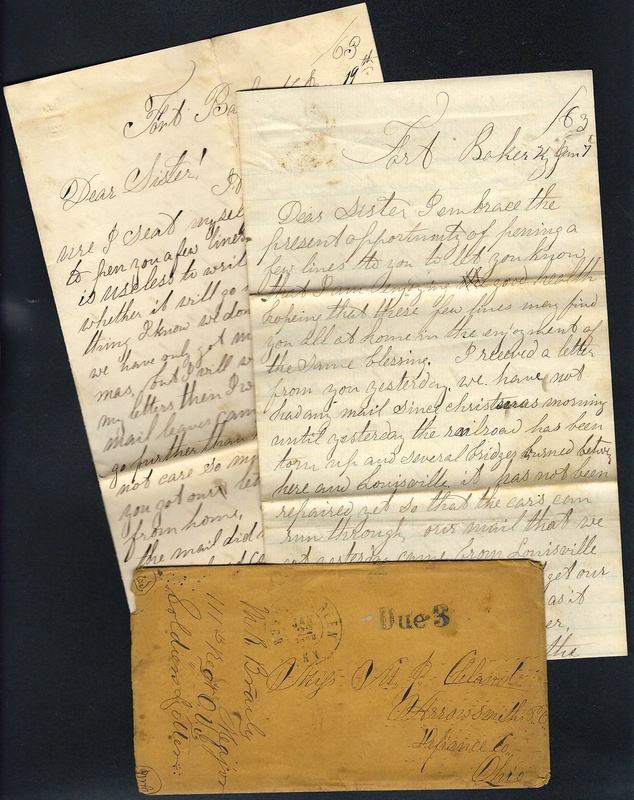 These letters were written by Corporal John W. Cleland (1843-18xx) who enlisted in Company F, 111th Ohio Ohio Infantry in September 1862 at age 19. He was promoted to 1st Sergeant in March 1863 shortly after this letter was written. In April 1864, Sgt. Cleland was promoted to 2nd Lieutenant and in May 1865 to 1st Lieutenant. He was mustered out of the service with his company in June 1865 at Salisbury, North Carolina. After the war, I believe John moved to Decatur, Illinois. John Cleland (1843-18xx) was the son of Arthur Cleland (1803-18xx) and Mary Clark (1814-18xx) of Defiance County, Ohio. Arthur was born in Killy Leagh Parish, County Down, Ireland, and came to the United States with his parents in 1817, arriving on the schooner Vigilant. They landed at Wilmington, Delaware, and first resided at Pittsburgh, Pennsylvania, before moving to Jefferson County, Ohio. John wrote the first two letters to his sister, Mary Jane (“Jennie”) Cleland (1841-18xx), from Fort Baker which was constructed on a hill north of the city of Bowling Green, Kentucky. The fort overlooked the Barren River and was strategically located to guard against troops approaching the city from the north and the east. We learn from these letters that Companies A & F were garrisoned in Fort Baker while the remainder of the regiment were garrisoned across the river in Fort Buckner. The third letter was written from a camp near Glasgow, Kentucky. I embrace the present opportunity of penning a few lines to you to let you know that I am enjoying good health hoping that these few lines may find you all at home in the enjoyment of the same blessing. I received a letter from you yesterday. We have not had any mail since Christmas morning until yesterday. The railroad has been torn up and several bridges burned between here and Louisville. It has not been repaired yet so that the cars can run through. Our mail that we got yesterday came from Louisville on a steamboat. We won’t get our mail regular now for awhile as it will have to come by the river. Steamboats come up the Barren River as far as Bowling Green — small steamers. They do not go any further up the river. We have moved to a different place since I last wrote to you. Our company and Company A are occupying a fort about ¾ of a mile from town on the railroad. We came over here a week ago last Monday and have been repairing the fort since. We had our tents set outside of the fort till today. We got it ready for moving into and moved into it. We have our tents fixed so we can live here quite comfortable now. We have a stove in ours. It cost three dollars — only about thirty cents apiece. I am writing this evening so that I can send it with Mr. Stoner from Defiance who is going home tomorrow. It will go safer sooner perhaps if he mails it at Defiance. He is going by the boat. I must soon stop for this evening as our candle is about burned out & we hain’t got anymore. Since the railroad has been tore up we don’t get full rations of candles and such things. We don’t get hardly any salt and but little sugar. We don’t get full rations of anything but crackers and beef although we have all we want to eat by trading our coffee for flour meal, &c.
There has been some pretty hard fighting down at Murfreesboro lately [see Battle of Stones River]. Our forces have come victorious. While the battle was going on, they shipped soldiers through here about everyday. Some expected that the 111th would be called for but it wasn’t. I guess we are elected to stay here now as we have got settled in this fort and the rest of the regiment is occupying Fort Buckner. I suppose you have not got any letters from me for a couple of weeks as the mail has not gone out. I wrote a few lines last week and directed them to William but I don’t know whether the mail has gone out since I wrote. Written in haste. Direct as before. Mr. Stoner is going out early this morning so I cannot write anymore. He came down for his brother ¹ who was sick. He belonged to Co. E, but when he got here he was dead and buried. ¹ Decatur Stoner of Co. E, 111th Ohio Infantry, died on 23 December 1862 at Bowling Green, Kentucky, at age 19. His parents were Solomon Stoner (1802-1854) and Margaret Vorhis (1808-1877). The brother who traveled to Kentucky in an attempt to bring Decatur home to Toledo was probably the eldest son, John W. Stoner (1837-1899). It is with pleasure I seat myself this evening to pen you a few lines. Perhaps it is useless to write as I do not know whether it will go home or not but one thing I know, we don’t get any mail lately. We have only got mail once since Christmas but I will write and if you don;t get my letters then I won’t be to blame. Our mail leaves camp but maybe it don’t go further than town. But I would not care so much if I were only sure you got our letters about getting any from home. I head the reason why the mail did not go through was because the railroad company would not carry it for what they used to. We are having good times this winter since we got into this fort. The other part of the regiment over the river have a good deal harder times than we do. The boys there have to stand picket or camp guard every other day while we only have to stand one post of picket and no guard camp. The Major ¹ commands us and the Colonel ² commands over there. Major says his boys don’t need any camp guard while the Colonel can’t hardly get men enough on duty to suit him. Colonel’s men have to be on duty every other day — two hours on and four off as id the rule while Major has it so arranged that our boys have to stand only one hour in the day apiece and at night two stand together and stand two hours which only makes three hours out of twenty-four and only come on about once in four or five days. The boys all hate the Colonel but they all like the Major. Major is a very rough man and things must just go to suit him but he thinks a considerable of the boys and like to see them get along as easy and as well as possible. He dresses just as a private. He hardly ever puts on his officer suit — only on dress parade when it is necessary. I suppose you have heard before this of the death of [Sergeant] Lewis G. Bowker ³ as it was telegraphed home they would have sent the corpse home but they could not raise money enough. It required thirty dollars. They got a dispatch yesterday in answer to the one sent home from Foot. He said to send him home and they would pay the express. He will be took up tomorrow morning and sent, or that is the intention now. Captain [John E.] Hill is still at Louisville. Lieutenant [Solomon] Callender is not well enough yet to be with the company. In my last letter I said we had not heard of any of the boys of Company E, 21st Regiment, being killed in the fight at Murfreesboro but we learned different next day. Albert Farnesworth and Charles was in it. They wrote back they were the pioneers of our company. The pioneers of the regiment were called for a few days before the battle to go to Nashville (there are two pioneers to each company; their business is to go wherever they are wanted to build bridges, &c.). They are still down in Tennessee somewhere. Shannon Musser is the only one from our part of Defiance County that was killed. There are some wounded among which was Samuel Grier, Wesly Johnson, and one or two others. We have been having a spell of winter for a few days. It commenced raining on the morning of the 14th and rained all day and part of the night when it turned to snowing and snowed part of the next day. The snow was about 8 or 10 inches deep. This the people [say] is something unusual for Kentucky. They say they have not had as much snow at one time before for 12 years. I suppose you have sleighing in Ohio. It rained all night last night. Our snow will soon be gone, I guess. The river is getting very high. The 100th Regiment has got as far down as Danville, Kentucky, at last. One of our boys got a letter last night from one of them. There was two or three letters came to the company but none from home. No more at present. ¹ Maj. Moses Randolph Brailey (1816-1888) was 44 years old when he was commissioned Captain of Co. I, 38th Ohio Volunteer Infantry on August 21, 1861. He served with the regiment briefly, and was wounded at the Battle of Mill Springs, Kentucky in January 1862, causing him to resign his commission February 9, 1862. He later served as a Captain of the 3 months 85th Ohio Volunteer Infantry, mustering in June 10, 1862 as Captain of Company G. He was mustered out September 23, 1862 at Camp Chase, Columbus, Ohio and immediately enlisted in the forming 111th Ohio, his commission dating to August 28, 1862. He was promoted to Lieutenant Colonel to date February 1, 1863, and was discharged for disability following the fall campaign of 1863, his discharge occurring December 29, 1863. At the end of the war, Colonel Brailey was given Brevet promotions to Colonel and Brigadier General, both dating to March 13, 1865. Brailey’s brevet promotions to Colonel and Brigadier General were for meritorious services rendered at the Battle of Mill Springs, Kentucky while he was with the 38th Ohio. General Brailey served as Comptroller of the Ohio Treasury from 1865 to 1871. ² Col. John R. Bond (1821-1872). ³ Sergeant Lewis G. Bowker, Co. F, 111th Ohio Infantry, died at Bowling Green, Kentucky, on 17 January 1863 at age 23. I again take the pleasure of penning you a few lines to let you know that I am as well as usual. Today is Saturday. We do not have to drill any as it is wash day and I will not have much to do so I thought I would commence this letter. We are still at Glasgow and no signs of us leaving although we might be called any day to leave. We have to drill everyday (Saturdays and Sundays excepted) — company drill in the morning and battalion drill in the afternoon or evening. The weather is getting to be very warm here now in the day time but unlike Ohio, the nights are generally cool. The nights are always cooler here in comparison to the days than they are in Ohio. The dews are always heavier. Cherries are ripe here now. I eat early cherries about two weeks ago. Such things are considerably earlier here than at home. I think the Democrats of Ohio are getting insane to think of nominating [Clement] Vallandigham for Governor and expecting to elect him — a man that was sent beyond our lines by order of Gen. Burnside for speaking disloyal sentiments. They must be running short of timber, I think, if they claim that the so-called Union Party — or in other words, Republican Party — are so far wrong. Why did they not nominate a man that there would be some hopes of his being elected? The soldiers of Ohio, I suppose, will have the privilege of voting this fall and Vallandigham will run very poorly in the army. I noticed in the paper last night the Union nominee for State officers. The candidate for Governor, I understand, is a renegade Democrat. This is done to draw votes, I suppose, and show out their “no party” principles. I notice a couple of pieces in the last Defiance Constitution from the 100th Regt., Co. D — one from H. O. Zigler,¹ the other from Asa Johnson. ² I think the writers both lack wit and if the editor of the Constitution was a decent man, he would not publish such profane language as is in these pieces. Evening. I stopped writing this forenoon expecting to get a letter from home this evening but was disappointed. I got an Observer but no letter. Perhaps you didn’t have anything to write. Well I haven’t got much to write this time either. I expect to have a better story to write the next time if I can get a couple of days leave of absence the first of the week. I want to go and see the Mammoth Cave. Capt. was there this week. It will cost a considerable but Capt. says it is worth the money and I intend to see it if it is possible. It is about 21 miles from here to the cave. There has been several officers from our regiment to see it. I see in this evening’s and a few evenings back in the papers that the rebels are getting up into the northern states lately, both in Pennsylvania and Indiana. I wonder if any of the people up there will try to compromise with them when they are stealing their horses, property, and destroying their property. The news from Vicksburg is not quite as favorable as it might be hoped but it is still hoped that Grant may prove successful yet. If the people and administration only let him have his time, if our Generals had only been a little more slow and cautious, they might have had more of these strongly fortified places by this time. It is something that was not thought of in some of the old countries to undertake to take such fortifications without a siege. It is a great error in any General to undertake to take these strongholds by storm, to march men onto fortifications to be slaughtered. Our generals are too fast. Since McClellan has been relieved of the command of the Army of the Potomac, it never has amounted to anything. But if the war is not carried on just to suit us all, yet the best we can do is to do our duty the best we know how. That, I think, at present is to support the war and whip the rebels for this is the only way to close the war. Since I commenced writing, Capt. was looking at my paper and saw some writing which told the reason why I did not get a letter this evening. I do not expect the next lot of men will get home as soon as those comes back that are at home for the furloughs will have to go to Burnside now to be approved. Before it was not necessary to go further than the brigade commander. I would like before the next set of men comes back that you would make me a couple of good shirts and send them to me. They should be made of light flannel or something of that kind. I do not like the government shirts. There is not cloth enough in them and I think it will be cheaper to have them made anyway as the government shirts are not very well made. I will close for this evening and write some more in the morning if I have time. The mail goes out tolerable early in the morning. Capt. and Lieutenants are in bed and I must go so good night. Morning. I have just called the roll and must put this letter in an envelope so that it may go out this morning. William Otis got a letter from home last night which said that George had a sinking chill and was not expected to live. His father was in too much a hurry most to get him home. He ought to have let him get a little better before starting. I shall have to close so good bye for the present. ¹ Henry O. Zigler [also spelled Zeigler] (1817-1894) was 44 years old when he enlisted as a musician in Co. D, 100th Ohio Infantry. He enlisted in July 1862 for three years. He wrote a letter home on 9 April 1863 from Mount Vernon, Kentucky, that was published in the Defiance Democrat on 13 June 1863. He was from Defiance, Ohio. 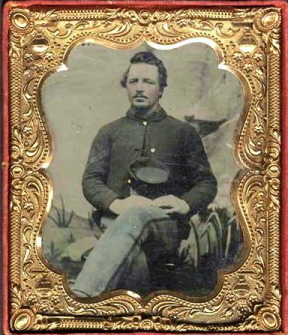 ² Asa Johnston was 26 years old when he enlisted as a private in Co. D, 100th Ohio Infantry. He was killed on 6 August 1864 in the Battle of Utoy Creek, Georgia.